For some owners, the Aprilia RST1000 Futura sits a little too close to the vertical for comfort when parked on the sidestand. Given the bike’s tendency to catch the wind, more than one Futura has been blown off its sidestand in high winds. If this really bothers you it can be fixed by replacing the stand with an upgrade apparently supplied as standard in the US. The US spec stand allows the bike to lean over further on the stand, so it’s longer and it also has a larger ‘cup’ at the base, therefore slightly reducing ground pressure. It’s true you have to be careful where you park a stock (non US) Futura on anything but level tarmac, so this has to be an improvement, even though it’s not a popular modification in the UK at least. Getting hold of the parts is relatively easy through the US importer AF1. You might also find them in the UK, perhaps on e-bay. If you know where then get in touch. MauriceOz is an owner who did it and swears by it. 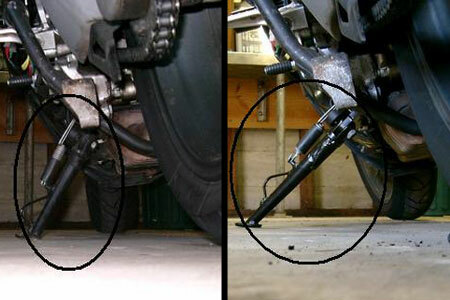 The pictures below show his bike before and after.